The Rain Water Harvesting Kit is intended to demonstrate the various stages in the rainwater harvesting process on a small scale. 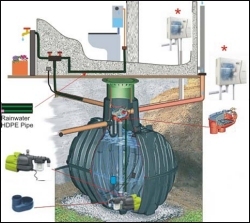 Rainwater Harvesting is now a requirement under level 3 of the Plumbing syllabus. For training purposes the roof guttering and downpipe is mounted onto a vertical backboard. A small submersible pump enables water to be continuously circulated from the storage tank to the roof guttering. This is installed above a 250 litre Rainwater Storage Tank. 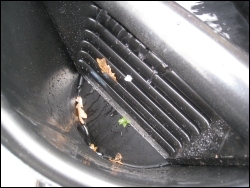 Rainwater from the gutter is channelled via a downpipe into the inlet at the top of the filter. 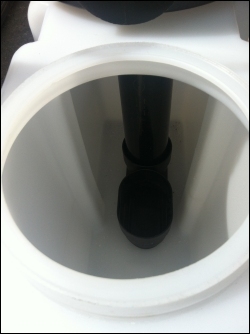 Filtered rainwater enters the storage tank via a calmed inlet. The purpose of this is to prevent disturbance of the settled sedimentation layer and to supply the lower part of the water with oxygen. Therefore the water remains fresh. Practical application - Any floating materials are skimmed off by the chamfered slots when the tank overflows. This enables continuous operation whilst teaching to demonstrate the entire process. 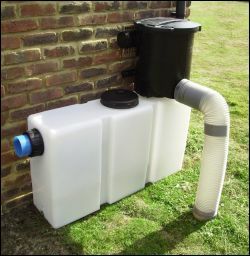 Please note: We also supply larger rainwater harvesting systems - available upon request. Level 3 Plumbing courses (City & Guilds 6189) that include a module on 'Rainwater Harvesting' are now required to include an understanding of automated control i.e. how rainwater can be supplied to demand, dry-run protection of pumps and how a mains backup system can be used to control supply of rainwater from the storage tank with top up from the mains. This is an element that is described as 'back-up supply' in the assessment criteria and students need to test the correct functioning of such a control unit. The automated ‘Direct Feed’ Rainwater Harvesting Kit is designed to demonstrate these aspects within the system. It demonstrates how to harvest rainwater from a roof and store it in a tank for non-potable domestic use, thereby reducing mains water demand. The pump in the storage tank sends rainwater directly to the point of use e.g. toilet flushing, garden watering etc. If the stored rainwater runs out, mains water is automatically brought to the system to meet the demand. The photo above shows the set-up we have installed in the warehouse. Water enters the rainwater storage tank via downpipe and calmed inlet. To simulate this process mains water could be gravity fed from a header tank (not included). Water from the storage tank can be pumped up to feed, for example, one or two WC’s. Supply to automatically switch between harvested and mains supply. 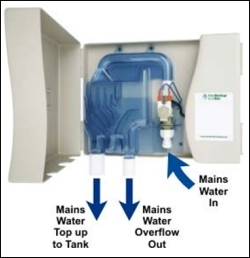 The automated system utilises a float switch and solenoid valve; the float switch detects when the rainwater storage tank is empty and opens the electrically-actuated solenoid valve so that mains water flows into the bottom of the tank. When the float switch floats off the bottom of the tank it turns the solenoid valve off. The bulk of the storage tank remains empty ready to admit the water from the next ‘rain shower’. 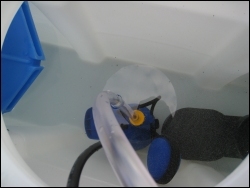 The photo below shows the 'Rain Backup in a Box' mounted on the wall above the tank. 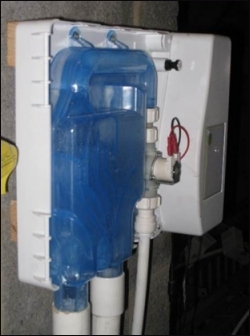 When rainwater level drops, mains water running from the solenoid valve into the tundish can be seen through the transparent cover and heard through the aperture at the side. The ‘Rain Backup in a Box’ is a compact unit, with one electric plug to a wall socket, mains water input and a pipe to the storage tank. The training rig utilises the bottom section of a Graf Hercules rainwater tank (Max. capacity 800L), enabling all round accessibility to observe the various aspects of the rainwater harvesting process, including the filter unit that would normally be enclosed within the upper section. An important part of this kit is the HydroForce Series 3 clean water pump. (* Two pumps are supplied with the kit). 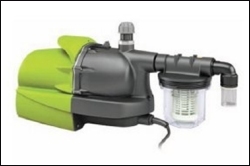 It is an electronically-controlled, pressure-sensitive, centrifugal roto-dynamic pump with no reciprocating parts. 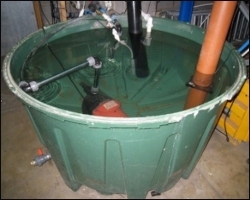 Within the main Rainwater Storage Tank it functions as a submersible pump (See above photo), however for below ground installations it can be also be externally connected and installed above the tank. In the kit the second pump sits on top of the storm water overflow tank. 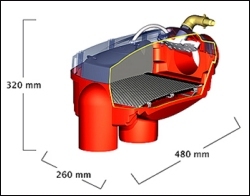 This dry-run cut out feature can also be observed with the storm water pump which will turn off when the contents have been pumped back into the main harvesting tank. The automated system kit incorporates an Optimax-Pro rainwater harvesting filter which is recommended for use in underground tanks. The filter combines an extremely low height offset of just 165mm with maximum yield. It is very low in maintenance due to its self-cleaning construction. There are three layers to the filter; 1) on the top is the stainless steel fine filter with a mesh of only 0.35mm (350 microns or 0.01 inches) with a very smooth upper surface which aids the self-cleaning process, 2) a synthetic carrying surface with a diamond pattern and 3) the collector surface for micro particles. The filter can be visually checked through the transparent cover when closed, or the cover and filter can be lifted as required for inspection or further cleaning of the collector surface.